None vs. Central Mountain or Lock Haven. – The Bison have won 43 of their past 48 games overall and 36 of their past 37 regular-season games. – Central Mountain High School was formed in 1999 with the merger of Lock Haven High School, Bald Eagle Nittany High School, and Sugar Valley High School. Clearfield never played BEN or Sugar Valley in football, but had a long-standing series with Lock Haven that was played most years between 1956 and 1998 (a total of 43 meetings). Lock Haven held the upper hand the series with a total of 25 wins, 16 losses, and 2 ties. Clearfield won 8 straight meetings from 1982-1989 and from 1982-1998 went 11-6 against the Bobcats. Lock Haven dominated the early years of the rivalry, going 19-5-2 from 1956 to 1981, including going 9-0-1 between 1959 and 1968. – Clearfield’s 8 rushing touchdowns set the school’s single-game record. The team’s previous high was 7, accomplished five times: vs. Bellefonte in 1978, vs. DuBois and Bald Eagle area (both in 2002), and vs. Central and Lewistown (both in 2008). – The Bison’s 58 points scored is the third-highest total in school history since 1937, trailing only a 65-26 win over St. Marys in 1999 and a 60-8 win over Punxsutawney in 2005. – The 88 combined points scored by both teams is the highest mark in a Clearfield game since a 56-35 loss to Bradford in 2006. The highest-scoring game in school history also came against Huntingdon as 102 total points were scored when the Bearcats beat the Bison 68-34 in the 1998 PIAA playoffs. – With his 202 yards rushing, Christian Lezzer surpassed the 3,000-yard mark for his career. He now sits at 3,006 career rushing yards on 412 carries. Lezzer also came one touchdown shy of tying the District 9 (and school) record for rushing touchdowns in a single game. According to d9sports.com, former Bison Dave Richards and Redbank Valley’s Mark Strothers share the district record with 7 rushing touchdowns in one game. Richards set the mark in 2002 in a game against Bald Eagle Area in which he rushed 16 times for 363 yards, while Strothers equaled the record earlier this season. – As a team, the Bison have rushed 220 times for 1,524 yards and 22 touchdowns through the first four games. As a point of reference, 33 teams in school history have rushed for fewer than 1,524 yards in a season. The 2013 Bison are averaging 381 yards per game and 6.9 yards per carry. – The Bison have won 42 of their past 47 games overall and 35 of their past 36 regular-season games. – The 68 points scored by Huntingdon against Clearfield in 1998 is the highest point total by a Bison opponent since 1937. The top ten points scored by Clearfield opponents are shown below. – The 63 rushing attempts by Clearfield are tied for the second-most carries in a game in school history. 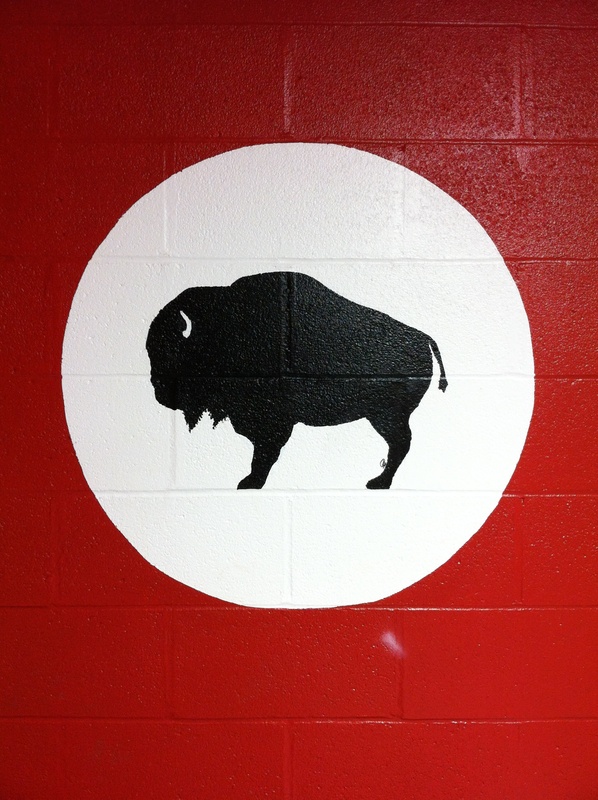 The Bison also had 63 rushing attempts in a 45-14 win over Bellefonte in 1978. The school record for rushing attempts in one game is 68, set in 1947 against Punxsutawney. – Clearfield has had 50 or more rushing attempts 8 times in the past 28 games. For comparison, the Bisons registered 50+ rushing attempts just 3 times from 1986-1997, a span of 132 games. – Tyler Stratton’s 188 yards rushing are a career high, surpassing his 164 yards rushing last year against Huntingdon. His 32 carries set another career high, besting the 21 attempts he had against Huntingdon in 2012. Stratton is now 16th in school history with 1,539 career rushing yards. – Christian Lezzer now has 2,804 career rushing yards, which puts him 4th on the school’s all-time list. He is 196 yards shy of becoming the 4th player in Clearfield history to reach the 3,000 yard mark on the ground. The top three rushers in Bison history are Dave Richards (4,639), Josh Harbold (3,679), and Isiah Morgan (3,120). – Clearfield is 17-1 in its last 18 road games. The Bison have won 41 of their past 46 games overall and 34 of their past 35 regular-season games. – With his 161 rushing yards, Christian Lezzer passed Stu Wiggins (1950-1952) on the school’s career rushing yards list. Lezzer (2,620) now sits in 5th place in school history and is 93 yards behind former teammate Beau Swales for 4th on the all-time list. – Tyler Stratton also moved up the career rushing yardage list, going from 23rd all the way to 18th. Stratton currently has 1,351 career yards and passed Doug Wagner (1,216), Ken Carlson (1,218), Curtis Frye (1,250), John Rockmore (1,309), and Terry Briskar (1,350) with his 148 yards Friday night. Stratton is just 2 yards behind Phil Morrison for 17th place on the list. – Seth Caldwell’s 92 yards rushing give him 215 yards in the first two games of his freshman season. Listed below are the rushing statistics of every other known freshman in Clearfield history to register a rushing attempt. If I am missing someone, please let me know. – Clearfield enters Friday night’s game with a 16-game home winning streak. – The Bison have won 40 of their last 45 games overall and 33 of their last 34 regular-season games.